"If you watch one speech in its entirety, this may be the one to choose. Herman Cain, so far the only declared candidate for the GOP presidential nomination, stole the show yesterday with his speech in the late afternoon. People left the ballroom saying that he moved them to tears..."
Wondering why Cain was showing his sleeves? His explaination via his twitter feed is, "I told y'all I don't have any tricks up my sleeve. 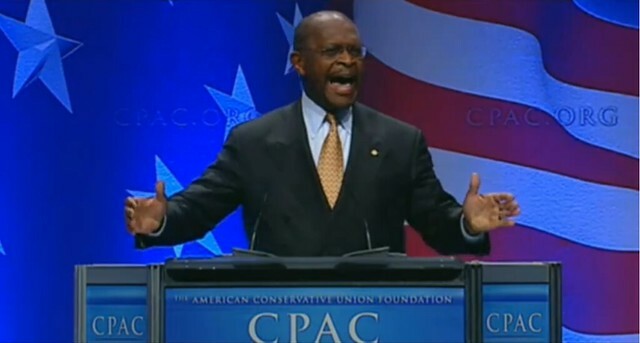 No TelePrompter required..."
Roughly two hours before businessman Herman Cain is scheduled to take the stage at CPAC, he still doesn't know exactly what he's going to say. Cain told Hotline on Call that he prefers when giving major speeches to let the audience dictate his message, a free-wheeling style that's practically unheard of among presidential hopefuls. "I have some idea of what I'm going to say, of course," Cain said, laughing. "My outline is in my mind. I already know the first 80 percent of what I'm gonna talk about, but that last 20 percent I don't figure out until after I get in front of the audience. I like to get a feel for the audience and read their reaction to certain things, and based upon their reaction I'll decide where to go next." He had one or two memorable lines, such as: “Stupid people are ruining America.” But one or two middling zingers do not a credible candidate make. Given his flat performance, Cain’s going to have to work extra-hard going forward to win a place in the 2012 process. I marvel at the lengths to which white liberals will go to abuse and discredit their black conservative enemies. They rarely treat white conservatives in the same demeaning fashion. He was a formidable presence when he took the stage on Friday. He mentioned he has lived on this Earth for 65 years, but when he sings of America, he loses fifteen years in the blink of an eye. The Right Scoop: "Herman Cain gave an electric speech..."
Nice Deb: "...Herman Cain is my pick for 2012. Listen to this, and tell me if don’t agree." Finally, more hate-filled trepidation from the left. It was a great speech. I've heard his radio show, too. He's an impressive guy. If you like Cain, please give him a little extra support. The left will work extra hard to bring him down because he is black. Wow, I could listen to Herman Cain all day.